BANGI, 23 Dec 2013 – A biography on the life of The National University of Malaysia’s (UKM) Vice-Chancellor Prof Tan Sri Dato’ Sri Dr Sharifah Habsah Hassan Shahabudin –Inspiring Futures – was launched here today by the university’s Chancellor Tuanku Muhriz Ibni Tuanku Al-Marhum Tuanku Munawir. The book Inspiring Futures is about the life and career of Prof Sharifah Hapsah – from a medical graduate to a career in research in medical education, to the apex of her profesion as the country’s first woman Vice-Chancellor at UKM. Authored by Datuk Dr Rokiah Talib, the famous biographer and lecturer, it was published by UKM Publishers company. Prof Sharifah Hapsah signed copies of the book and later viewed the exhibition of photographs used in the publication along with Tuanku Muhriz, who is Negeri Sembilan yang Di-Pertuan Besar, with Tuanku Aishah Rohani Tuanku Besar Mahmud and Tunku Ali Redhauddin Ibni Tuanku Muhriz, the Tunku Besar Seri Menanti. 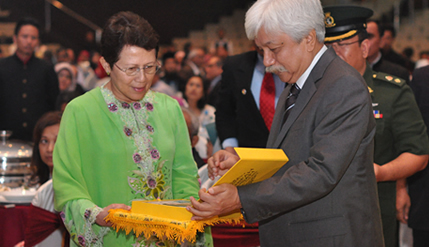 Prof Sharifah Hapsah Naib was appointed as UKM Vice-Chancellor on August 2006. Prior to that she was the university’s Director of the Centre for Academic Development and head of the Medical Education Department. She had also been the chairperson of the Agenda of Critical Governance in the National Higher Education Strategic Pelan, Higher Education Ministry, member of the advisory board of the Bureau of Public Complaints at the Prime Minister’s Department. She is also member of the Yayasan Permata board of trustees, The National Women’s Council, The National Unity Advisory Panel and the National Permata Policy Coordination Council. Prof Sharifah Hapsah has also held the office of chairperson and CEO of the State Accreditation Agency (LAN) and helped draw up the charter of the Malaysian Qualifications Agency (MQA ) which took over the role of the LAN . In the international scene, she is the founder member of the Executive Board of the Association for Medical Education, WHO Western Pacific Region (AMEWPR) and member of the Executive Board of the Global Knowledge Partnership (GKP). She is member of the Global University Network for Innovation and Asia Pacific (Guni – AP) and the Working Group on the Revision of the 1983 Regional Convention on the Recognition of Studies , Diplomas and Degrees in Higher Education in Asia and the Pacific. She is also a steering committee member of the Talloires Network of Engaged Universities. Prof Sharifah Hapsah also been inducted as an Assistant Professor at Baylor Medical College , Texas Medical Centre, Houston , USA and an Honorary Associate of the University of New England. She has received numerous international and national recognitions, including the Fred Kartz Memorial Medal and the International Council for Distance Education (COL-ICDE) Award of Excellence. Prof Sharifah Hapsah is also active in community and volunteer services. She is President of the National Council of Women ‘s Organisations (NCWO), a non-governmental organisation which is the main advisory body to the government on women’s and gender issues. She also is the founding president of the Malaysian Association for Education in the Medical and Health Sciences (MAEMHS) and founding deputy president of the Malaysian Aids Council.